The amazing painted ripstop of Scott Hampton. Scott has been handcrafting his flying works of art for awhile now. 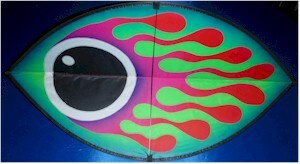 His kites are known instantly because of the special painting that he does on the fabric. 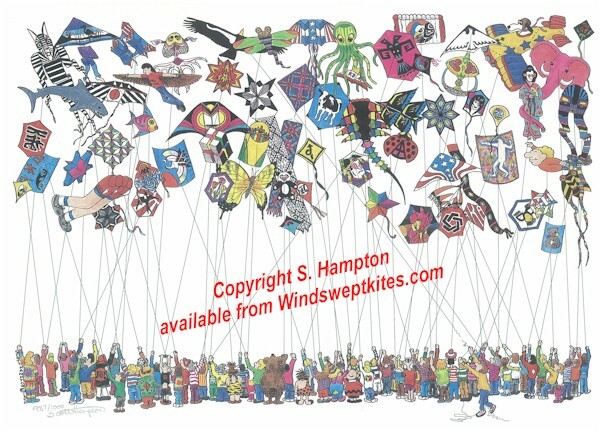 Each kite that he makes is unique since it has been hand painted by Scott. 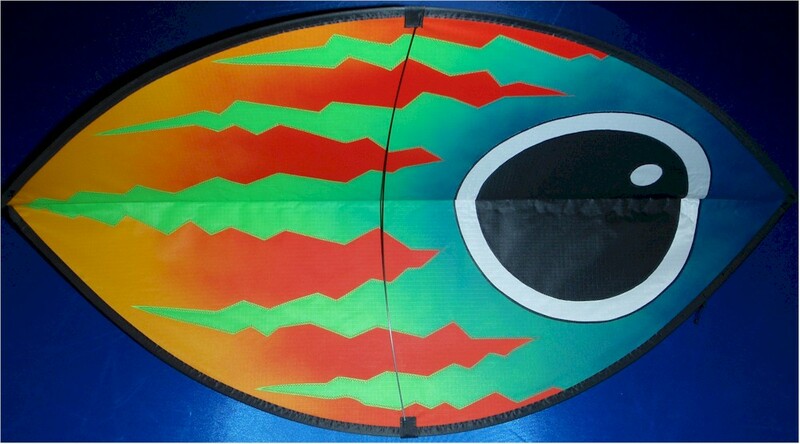 The colors and the gradations of those colors are unmatched out there in the kiting world. If the kite came with a plastic tube it is wise to store and transport the item in that tube. If you get enough of his pieces one day you may wish to invest in a hard case to carry around all of them without completely disassembling them! 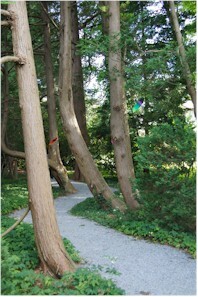 For more on the care and feeding of your Aerial Art please go here (lots of pictures!). Not from any bird that we know of, but obviously one that is colorfully painted. These Feathers are great to use for any use and every use. They are 11" x 4" and come in lots of colors. 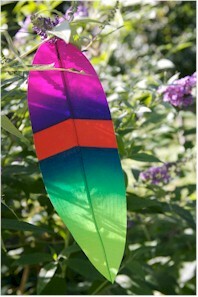 Each feather has a loop of line at the top, slip/clip/hang the feather anywhere you wish. We keep a random selection on hand -if you have a specific color pattern request, or wish a large quantity please ask. 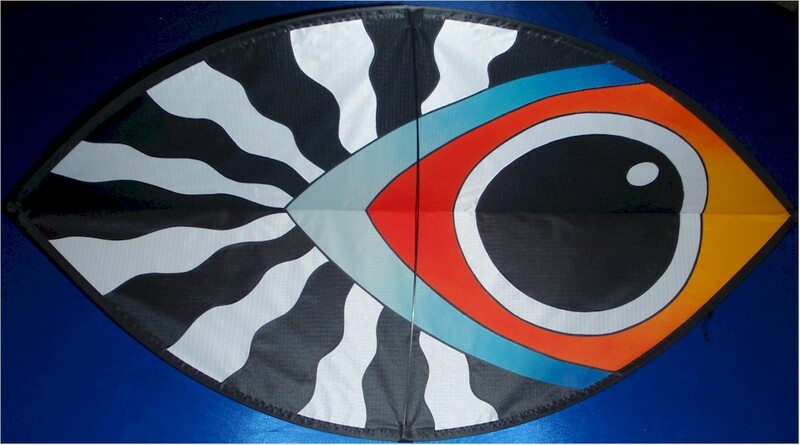 You can see some of the color patterns that we offer in the bottom right hand picture. Occasionally Scott will pull out some banners out of his bags and decide to use them or to sell some. 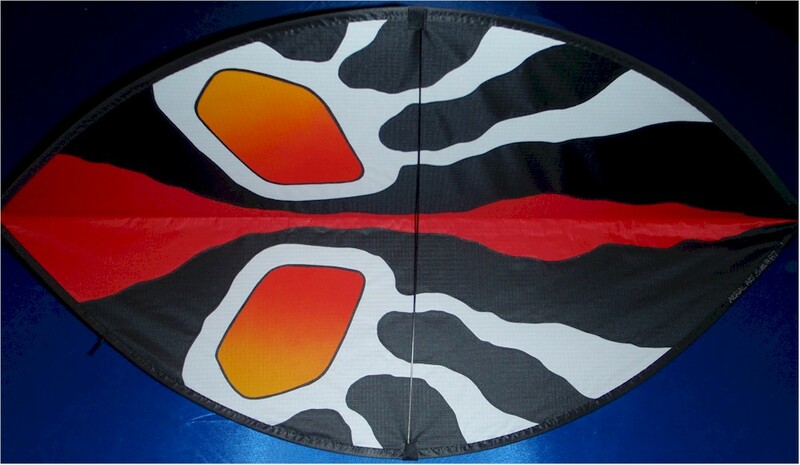 Lately he has been moving onto a heavier banner colth material and so the 1.5oz ripstop nylon banners are looking for new homes. 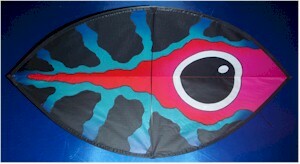 Each banner comes with a telescoping pole for it, you just need to add a ground stake and you are good to go! 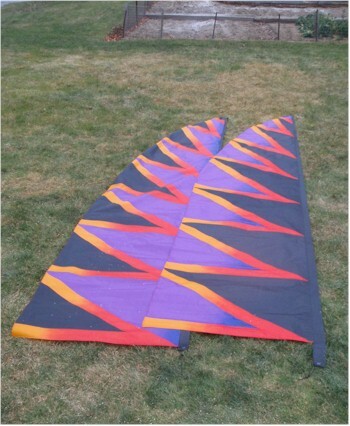 At this time we have a pair of 20' banners for sale. These are big banners, they are 4 feet wide!! They are a matching set, but we can break the pair up for you if you want. or if you want just one they are 280$ shipped. Send an email to claim these! In the mid 90's Scott did a limited run of prints. There are three different ones, and each is highly collectable! 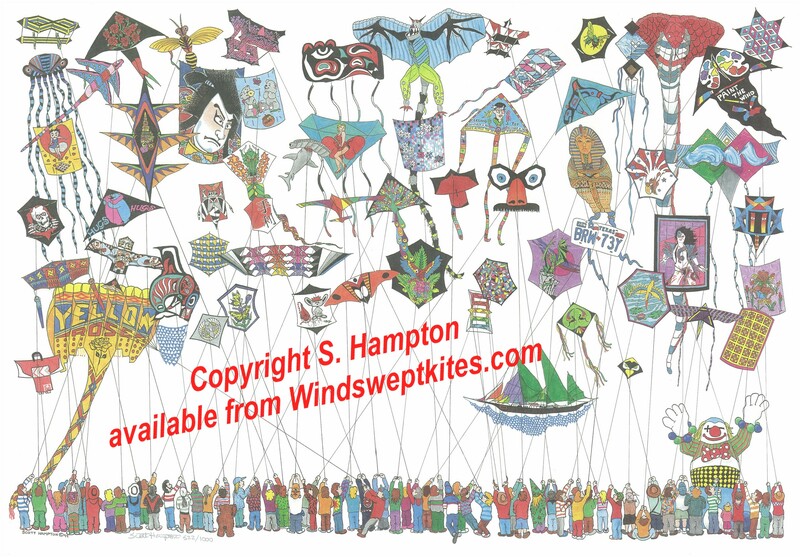 These posters show the kites of the day! 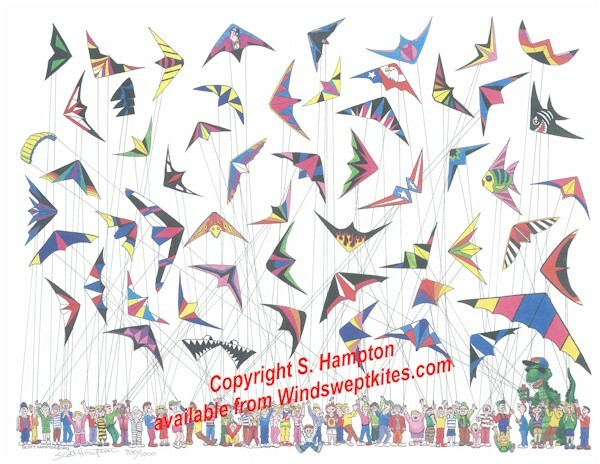 And each one comes with a list of which kites are which. You could use them as a test for your kite friends and see how many they could identify with out peeking! This is the last batch of the posters anywhere, and they are individually signed and numbered by Scott. Scott went to each and every kite designer to get their expressed permission to do these images. The red text is not on the prints....that is just here on line. Grab one of these prints when you can! To order please email us due to the limited supply. We are completely out of these prints. We have a few brand new cypods up for grabs! 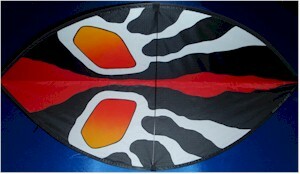 These three wing flyers are great for all sorts of wind, and the color just pops on a cloudy day or a sunny one. Cypods come in a tube about 50" long (the leading edge rods are quite long), and when assembled are about 3' long and about 2' wide. They are whimsical, fun, serious attention getters. In the time that they are not flying hang them in a corner of an office or a bedroom too. Because each one is hand painted no two are exactly alike another one. Personally, I would love to have a school of about 10 of them to fly together. 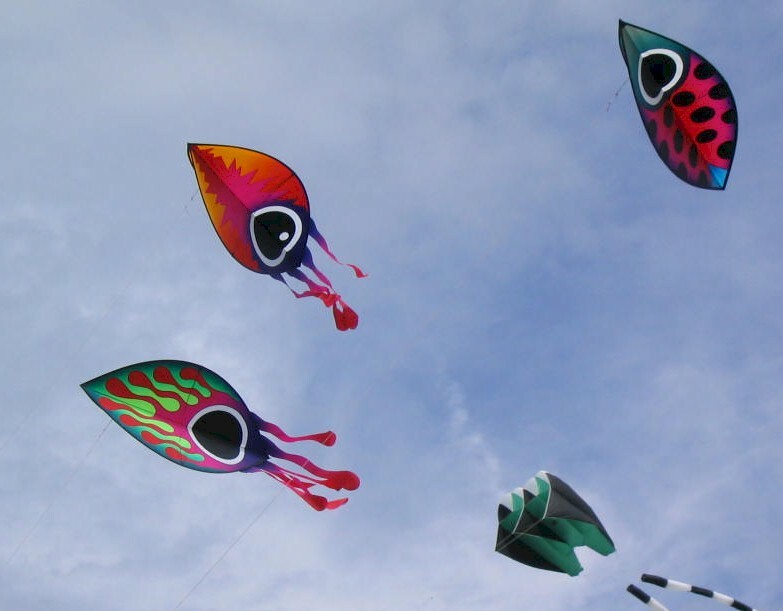 Here is a picture of three flying together. some are forward, some are backwards, but they are all beautiful! Please click into the page below for instructions on how to assemble them (the longs rods go inside the leading edge).